Advance-solicited; in stores March 28, 2001. 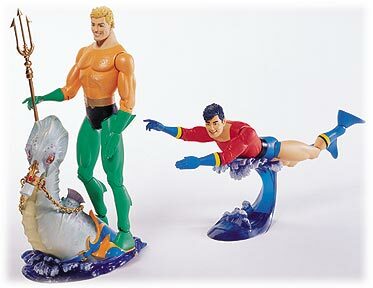 The King of the Seas and his trusted sidekick are showcased in this two-figure deluxe set featuring classic Silver Age interpretations of Aquaman and Aqualad.Aquaman comes with a trident while both figures come with multiple points of articulation. The set includes a 4.25" tall seahorse base with saddle which one of the figures' feet can slip into and hold onto the reins, and a 2.25" tall base that can simulate one of the figures swimming on a wave. Packaged in a 4-color window box. Retailers, please note: The AQUAMAN AND AQUALAD DELUXE ACTION FIGURE SET is manufactured to order, so only limited quantities may be available for reorder. Final product may differ from image shown. This item is advance-solicited. Orders must be placed with those for November-released product, solicited in this month's issue of Previews. Advance-solicited; in stores March 14, 2001. 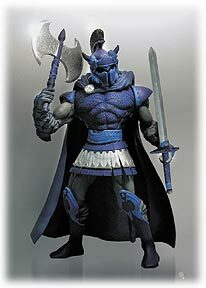 The first in a set of three foes and allies of Wonder Woman, the ARES ACTION FIGURE stands 6.25" tall without his helmet. Accessories for the God of War include an axe and sword (which fits in a scabbard on the side of figure). This figure features multiple points of articulation. Packaged in a 4-color blister pack. Retailers, please note: The ARES ACTION FIGURE is manufactured to order, so only limited quantities may be available for reorder. Final product may differ from image shown. This item is advance-solicited. Orders must be placed with those for November-released product, solicited in this month's issue of Previews. The skillful Artemis, who once took Diana's place as Wonder Woman, is a trusted ally to the Amazon Princess. Standing 6.25" tall, her accessories include a bow, quiver and a sword. This figure features multiple points of articulation. Packaged in a 4-color blister pack. 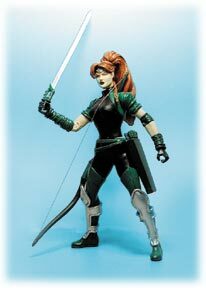 Retailers, please note: The ARTEMIS ACTION FIGURE is manufactured to order, so only limited quantities may be available for reorder. Final product may differ from image shown. This item is advance-solicited. Orders must be placed with those for November-released product, solicited in this month's issue of Previews. 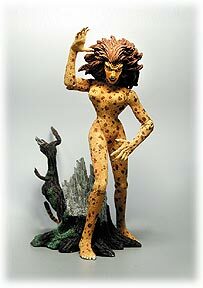 One of Wonder Woman's most ferocious foes, the Cheetah is ready to pounce � so beware! Standing 6.25" tall, the Cheetah figure comes with a base for posing. This figure features multiple points of articulation. Packaged in a 4-color blister pack. Retailers, please note: The CHEETAH ACTION FIGURE is manufactured to order, so only limited quantities may be available for reorder. Final product may differ from image shown. This item is advance-solicited. Orders must be placed with those for November-released product, solicited in this month's issue of Previews. Advance-solicited; in stores December 6. DC has gone back to print on this mammoth poster, reproduced from the stunning wraparound cover to the CRISIS ON INFINITE EARTHS collections, featuring a key identifying all 562 characters! 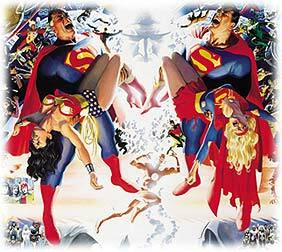 Painted by Alex Ross (KINGDOM COME) over pencils by originalCRISIS artist George P�rez, the 65" w x 28" h poster features a 1/2" solid black border "framing" the image, which otherwise appears without any additional graphic elements or logos. Also included is a free 2-sided 11" x17" black-and-white key naming all the meticulously painted figures on this amazing piece of artwork. Retailers, please note: The CRISIS ON INFINITE EARTHS OVERSIZED POSTER is manufactured to order, so only limited quantities may be available for reorder. This item is advance-solicited. Orders mustbe placed with those for November-released product, solicited in this month's issue of Previews. The World's Greatest Heroes are now a part of a stunning new PVC set, featuring classic Silver Age interpretations of Justice Leaguers. This set includes Wonder Woman,Black Canary, Green Lantern, Aquaman, Green Arrow, Flash and Martian Manhunter, with figures ranging from 3.6" to 4.125" tall in height. Packaged in a beautiful 4-color window box. Retailers, please note: The JLA SILVER AGE PVC SET is manufactured to order, so only limited quantities maybe available for reorder. Final product may differ from image shown. This item is advance-solicited. Orders must be placed with those for November-released product, solicited in this month's issue of Previews. Advance-solicited; in stores February 14, 2001. The popular statue sculpted by KINGDOM COME painter Alex Ross returns in a fully-painted full-color 9"tall version (smaller than the previously offered monochrome version). Each statue comes with an official Certificate of Authenticity. Retailers,please note: The KINGDOM COME FULL-COLOR SUPERMAN STATUE is manufactured to order, so only limited quantities may be available for reorder. Final product may differ from image shown. This item is advance-solicited. Orders must be placed with those for November-released product, solicited in this month's issue of Previews. He's lovable and cute, and not even CRISIS ON INFINITE EARTHS can keep him from your pillow! He's Krypto, the Super-Dog and he's the latest in a line of soft toys from DC DIRECT. Standing 7" tall when seated, Krypto comes complete with his S-shield dog collar and cape, and has a wireframe inside to pose him for standing, sitting or flying. Packaged in a 4-color window box. 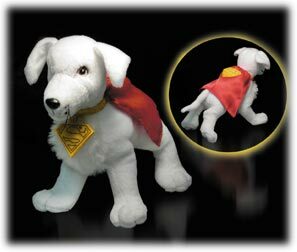 Retailers, please note: The KRYPTO SOFT TOY is manufactured to order, so only limited quantities may be available for reorder. Final product may differ from image shown. This item is advance-solicited. Orders must be placed with those for November-released product, solicited in this month's issue of Previews. Advance-solicited; in stores January 3, 2001. DC Direct's newest watch features Clark Kent and his transformation to Superman on the watch's face and bands with the phrase "This is a job for...Superman!" This watch comes in clamshell packaging. Retailers, please note: The SUPERMAN PLASTIC WATCH is manufactured to order, so only limited quantities may be available for reorder. Final product may differ from image shown. This item isadvance-solicited. Orders must be placed with those for November-releasedproduct, solicited in this month's issue of Previews. Pre-solicited; in stores April 11, 2001. For years, Commissioner Gordon used the Bat-Signal to contact Batman and illuminate the sky over Gotham City. 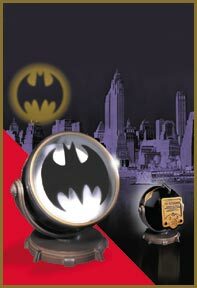 Now DC Direct brings you a reproduction of this well-known device in the form of an 8" tall x 6.7" wide rotating Bat-Signal prop which lights up to form the silhouette of a Bat. Create your own Gotham City emergencies! Batteries and cloud-filled sky are not included. Retailers, please note: The BAT-SIGNAL PROP is manufactured to order, so only limited quantities may be available for reorder. Final product may differ from image shown. This item is pre-solicited. Orders must be placed with those for December-released product, solicited in next month's issue of Previews. Pre-solicited; in stores March 7, 2001. 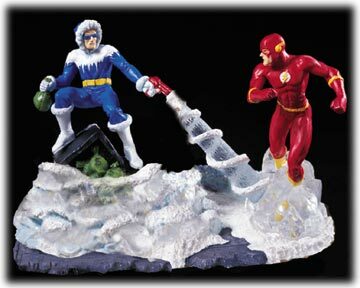 The Scarlet Speedster and his Rogues Gallery nemesis Captain Cold are featured in this beautifully sculpted statue, measuring approximately 7.25" wide by 5" deep by 6.5" tall. In this scenic offering, Cold is in the midst of a bank robbery as he fires his cold ray at Flash. Retailers, please note: The FLASH AND CAPTAIN COLD STATUE is manufactured to order, so only limited quantities may be available for reorder. Final product may differ from image shown. This item is pre-solicited. Orders must be placed with those for December-released product, solicited in next month's issue of Previews. Pre-solicited; in stores March 21, 2001. Will Eisner's indelible creation, The Spirit, comes to life in a gorgeous statue that stands 12" high x 5 1/2"wide x 3 1/2" deep on an engraved base of "The Spirit" logo. There is no doubt this statue has captured "the spirit" of Denny Colt's masked alter-ego. Retailers, please note: THE SPIRIT STATUE is manufactured to order, so only limited quantities may be available for reorder. Final product may differ from image shown. This item is pre-solicited. Orders must be placed with those for December-released product, solicited in next month's issue of Previews.